When I started writing this, I planned on it being a single post covering some background about organic chemistry methods discussed in Breaking Bad. But more importantly, how accurate those methods are. However, I soon realized covering everything I wanted to would turn this post into an essay. So I decided the best course of action would be to break it into parts. Part one will cover the structure and properties of the drug, while parts two and three will discuss its synthesis in regards to the show. Welcome back, faithful viewers. As promised, this time around I will tackle (with no spoilers!) some of the chemistry from the series Breaking Bad. For those of you living under a rock for the last five years, Breaking Bad chronicles protagonist Walter White’s descent from beloved high school chemistry teacher to methamphetamine-producing drug kingpin “Heisenberg.” You also may be quite tired of your friends’ raving reviews about the show, and probably wish they’d shut up about it already. But I digress. You’ll notice the wavy line representing a carbon-carbon bond. 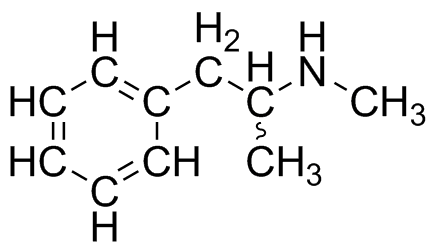 A wavy line exists because there are two possible enantiomers of methamphetamine. The dash (left) represents a bond going into the screen, while the wedge (right) represents a bond sticking out at you. Remember, organic molecules are three-dimensional, not flat. We differentiate these two enantiomers with the Latin prefixes dextro and levo, or simply d and l for short. 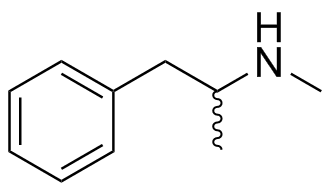 The structure on the left is levo-methamphetamine. It’s rather innocuous and there’s a good chance you’ve unknowingly used it before; it goes by the brand name Vick’s VapoInhaler. The one on the right is dextro-methamphetamine, and that’s the one favored by recreational methamphetamine users. A seemingly minor difference in structure turns a highly addictive and very destructive drug into a nasal decongestant. Methamphetamine is a psychostimulant, belonging to the broader class of psychoactive drugs. It acts on the central nervous system by increasing the amount of dopamine in the body, causing a variety of physical and psychological effects; hyperactivity, alertness, headaches, increased libido and self-confidence, heart palpitations, psychosis, stroke, and paranoia are just a few of the many effects induced by methamphetamine usage. Recreationally, the drug is introduced to the body virtually any way you could imagine, and in at least one way you probably can’t. Meth tablets were given to pilots during WWII to help them stay awake on long bombing runs, and it’s currently prescribed to treat attention deficit hyperactivity disorder (ADHD) and as a last-ditch treatment for severe obesity. Look out for my next post, where I’ll be talking about Walt and Jesse’s first cook in that run-down Winnebago.